Extended hours during hunting season. Basin Taxidermy is a family owned business located two miles north of I-10 (Henderson / Cecilia exit). Master taxidermist John Richard is dedicated to providing his clients with expertly crafted trophy mounts. At Basin Taxidermy we proudly mount all species including fish and ducks, yet John is best known for his work with the whitetail deer earning him a reputation as the "Whitetail Specialist." Whether your trophy is North American, Exotic or African John's skill and attention to detail will ensure a high quality mount that you would be proud to display. Stop by our showroom and check out the many options we offer when it comes to preserving your trophy of a lifetime. Basin Taxidermy is a family owned business located two miles north of I-10 (Henderson / Cecilia exit). 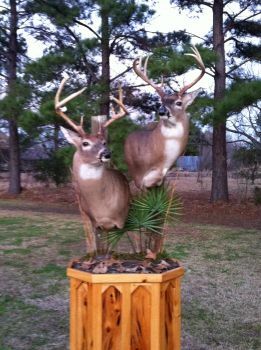 Master taxidermist John Richard is dedicated to providing his clients with expertly crafted trophy mounts. At Basin Taxidermy we proudly mount all species including fish and ducks, yet John is best known for his work with the whitetail deer earning him a reputation as the 'Whitetail Specialist.' Whether your trophy is North American, Exotic or African John's skill and attention to detail will ensure a high quality mount that you would be proud to display. Stop by our showroom and check out the many options we offer when it comes to preserving your trophy of a lifetime.